Australian Walking Company (AWC) has finalised plans for eco-sensitive accommodation on the Kangaroo Island Wilderness Trail and lodged development applications with the Kangaroo Island Council for the project. The company was chosen after the State Government called for Expressions of Interest, then requested a proposal to develop accommodation facilities and services associated with the trail. AWC have submitted plans to build eco-sensitive lodge accommodation at two sites along the trail within Flinders Chase National Park and will also renovate and operate the historic lighthouse keeper’s cottages at Cape du Couedic for use by both AWC and the non-walking public. The AWC will spend approximately $4 million developing the eco-sensitive accommodation. Two eco-sensitive wilderness lodges, accommodating up to 14 guests, have been designed to blend seamlessly with the sand dune landscape, with earthy-toned elements, timber joinery and locally sourced artwork that draw inspiration from Kangaroo Island’s icons. Infrastructure utilising off-grid sustainable lodge systems with lightweight modular sleeping pods and suspended floors will ensure minimal ground impact. Locally sourced building materials will be used where appropriate, and AWC will engage local expertise and resources for site development, revegetation and environmental offsets. Kangaroo Island Lodge Walk will be the first start-up operation for AWC, which brings together the expertise of award-winning market leader Tasmanian Walking Company (TWC), and owners Geoff Dixon, Brett Godfrey, Rob Sherrard and Scott Malcolm. TWC has operated for over 30 years and is the only commercial operator entrusted with providing private lodge accommodation within Tasmania’s World Heritage Areas and National Parks, supporting guided walking experiences on the Overland Track and Three Capes Track. Bookings for AWC’s Kangaroo Island Lodge Walk will open in January 2019, with the first walk departing in October 2019. 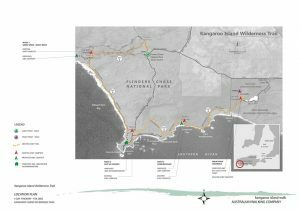 The $5.8 million KI Wilderness trail was a State Government initiative designed to strengthen Kangaroo Island’s reputation as an international tourism destination. Opened in October 2016, more than 4000 walkers have now experienced the 61km trail. An information session for Kangaroo Island residents will be held on Tuesday, 20 November 2018 at the Kangaroo Island Yacht Club from 2.30pm to 6pm. All are welcome to attend.